From sleek and simple wardrobe essentials to dazzling bespoke pieces, Ada's sustainable, conflict free lab diamond pendant necklaces are sure to delight. From rare fancy colored diamonds to breathtaking halos, our Diamond Concierge team is standing by to help you build a the perfect diamond necklace to add sparkle and elegance to any look. Ada Diamonds offers the world’s most brilliant, conflict free diamond jewelry. 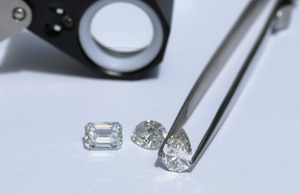 Our Diamond Concierge team specializes in creating stunning custom designs from the best lab grown diamonds on earth. Get inspired by our collection pieces, or build something from your imagination. Inquire today to get started. For a look as unique as you are. Wardrobe staples to elevate everyday. Choose a shape to express your style. Our curated collection of Ready to Ship fine jewelry pieces ensure you can get a brilliant, sustainable gift featuring lab grown diamonds in as little as 2 days.